information. I will send a copy of this request to other groups. Incidentally, I spoke at length with Pete WB9FLW, our ' "Beta test coordinator" in St. Louis. He was very happy that all three Vancouver boards being used to demonstrate packet radio there worked the first time they were turned on I This is the kind of thing that will convince people that packet radio is coming of age . P. S. I will speak to Rip Monday to pass information on the AMSAT modulation schemes, and to get the transponder performance data. We're also getting an L-band exciter and power supply to test our L-band transmitter project, which now has the backing of the University of Arizona E.E. Department. 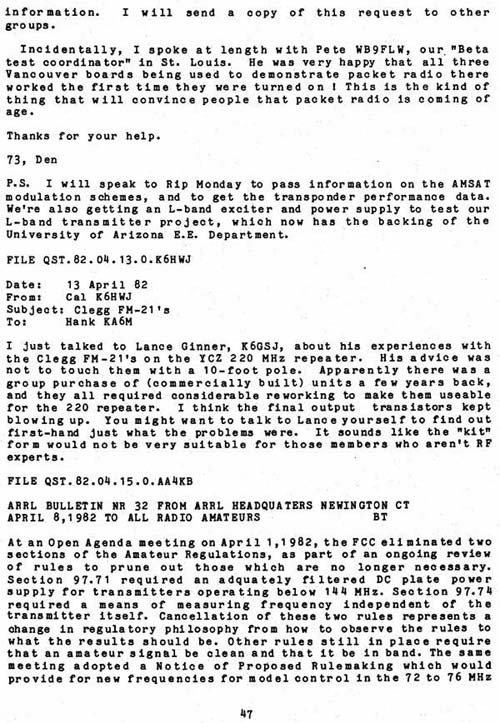 I just talked to Lance Ginner, K6GSJ, about his experiences with the Clegg FM-21's on the YCZ 220 MHz repeater. His advice was not to touch them with a 10-foot pole. Apparently there was a group purchase of (commercially built) units a few years back, and they all required considerable reworking to make them useable for the 220 repeater. I think the final output transistors kept blowing up. You might want to talk to Lance yourself to find out first-hand just what the problems were. It sounds like the "kit" form would not be very suitable for those members who aren't RF experts.